We know watermelons are healthy for us. They help keep our kidneys in good shape, they hydrate us, they make a sweet, refreshing snack and they are a rich source of lycopene, a natural substance with wonderful heart protective and antioxidant properties. But what about watermelon seeds? Are they any good for us? Should we eat them on purpose or not? The truth is that watermelon seeds are beneficial for us, contributing to good energy levels, nervous system and brain health, regulating blood pressure and offering antioxidant protection. What do watermelon seeds look like? Watermelon seeds are small, flat, oval-shaped seeds with a pointy end. As the fruit matures, the milky white seeds turn brown, then black and develop a hard outer shell which can be cracked using one’s teeth. As a child, I used to pick each and every one of those tiny black seeds and throw them away. When I grew older however, I started enjoying them for their benefits. 1) Antioxidant properties. Antioxidants protect cells and DNA against reactive oxygen molecules called free radicals, preventing cell and DNA damage buildup that may lead to potentially cancerous mutations. Antioxidants also prevent excessive inflammation at cell level which has been discovered to encourage the development of chronic diseases such as cardiovascular disease, degenerative nerve diseases, diabetes and others. 2) Improve blood circulation. Watermelon seeds contain 3.55 mg of vitamin B3, or niacin (per 100 g of seeds). Niacin has been shown to improve blood circulation and thus contribute to cardiovascular and nervous system health. Niacin is a perfect example of how important B vitamins in general are for nervous system and brain health and a deficiency cause symptoms such as physical and mental fatigue, brain fog, mood swings, even depression, poor blood circulation and digestive upset. 3) Regulate body fluids and blood pressure. 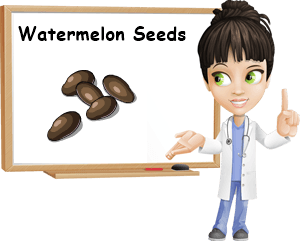 Watermelon seeds are a generous source of dietary potassium (648 mg), a mineral that regulates fluid levels in the body, preventing water retention that contributes to elevated blood pressure levels. Having enough potassium is also essential for good blood pressure levels because it neutralizes the negative effects of too much sodium from a high salt intake. According to a recent study conducted by the Cambridge Sacred Heart University, watermelon seeds are shown to significantly lower systolic blood pressure. Apparently, this contributes to a lower risk of myocardial infarction in individuals suffering from coronary atherosclerosis and angina. 4) Relieve fatigue by increasing the oxygen supply to cells throughout the body. This is done with the help of iron whose main function is to transport oxygen through red blood cells from the lungs to the rest of the body. At the same time, watermelon seeds are a great source of other essential nutrients such as calcium, magnesium, phosphorus, potassium, zinc, thiamin, riboflavin, niacin, folate and vitamin B6, all of which improve energy levels and help combat fatigue by helping the body function well. 5) Accelerate burn healing by avoiding the formation of a thick scar (Effectivity of watermelon (Citrullus Lanatus) seeds extract on inducible nitric oxide synthase). This is believed to be a result of natural compounds present in watermelon seeds. However, if you are eating watermelon seeds along with the fruit, you should be careful not to accidentally choke on them. Not only are they small, but they are also very slippery so, unless you want one to go down the wind pipe, remove them from the fruit and then eat them. Alternatively, you can buy watermelon seed kernels which are already shelled and, sometimes, even roasted. I say why waste good seeds already at your disposal? Save them, dry them for 2-3 days in a cool place and enjoy them. Good to know: if you are not looking forward to some unexpected and somewhat urgent trips to the loo, it is best to consume watermelon seeds without the hard, black shell. Maybe you have noticed that if you accidentally chew and swallow some watermelon seeds, they come out just as they came in. This is because the black shell is all fiber and fiber generally increases the frequency of bowel movements. But more important, the black shell may cause intestinal blockage which may endanger one’s life. Overall, watermelon kernels are surprisingly healthy. But have you ever wondered why there are increasingly more seedless fruits, watermelons and bananas included? Is it just to make farmers as poor as church mouses, prevent us from growing our own food in healthier conditions or just to deprive us of essential nutrients? Depending on the fruit, seeds in general concentrate impressive amounts of vitamins and minerals and seedless watermelons not only make no sense, but they are simply missing an edible and nutritious component.